River Road Church [G1520] - $8.00 : Yarn Tree, Your wholesale source for cross stitch supplies. Cross stitch pattern by Foxwood Crossings. 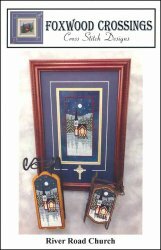 Two sled ornaments each featuring a church accented by pine trees and the night sky. Stitch counts: Picture 37 x 80, Bonus Rectangle Ornament 37 x 54, Medium Sled Ornament 29 x 51, and Large Sled Ornament 31 x 75.